We arrived in balmy Guam late the other night, wool coats in hand, after having traveled over 8500 miles. We went straight to bed, woke up before sunrise and started the day off like any good tourist-- with breakfast at McD's! I split a Big Breakfast with Austin, but quickly regretted not ordering one of these platters instead. SPAM! Eggs! Rice! I'm sure many of y'all are gagging about now, but I really do like it. Just add some soy sauce to the eggs and a little butter to the rice. The SPAM is good if you just pan fry it in a skillet for a bit. YUM. I am pleased to report that we spent the rest of the day enjoying the sun, sand and water. The camera just doesn't do the clear blue water and fine white sand justice. I think Noah had the most fun. 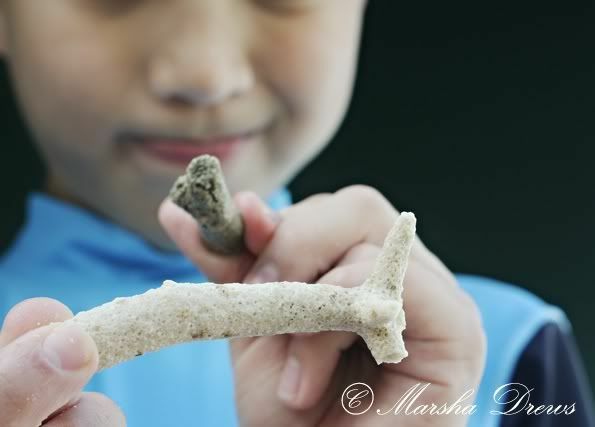 He spent much of the time exploring and finding treasure! Poor David, however, spent much of the time in our room with fever and general miserableness, so I don't really have pictures of him having any fun (yet). He started a 5 day trip today and will be back in... ummm, 5 days. His trip includes a 2 day layover in Fiji. Yup, FIJI. We brought our school books with us. We procrastinated the book learning all day today, thinking we would just work after supper. But when you swim, walk, swim, play, hunt for treasure, and swim all day, you are in no mood for school when the sun goes down. The boys were zonked out by 7pm! Talk about crazy. I guess we'll get up before sunrise again tomorrow. Is it bad that I keep having to look up the date online? Oh, I did have one picture of me from the day, just to prove that I was indeed here. Now y'all know what I'm up to. What are YOU up to? I sooo wish I was there with you guys, instead of sitting here on the subway, bundled up and still freezing in this 19 degree weather!!! That looks beyond amazing and with Korean food to boot! It's a dream come true! I am so happy for you. Enjoy your fun in the sun! Hey Marsha! It's been a long time, but it's been good to "catch up"! :) Glad you've made it safely and are enjoying yourselves. I'm sure we'd have a very hard time making school happen too when there are so many fun things to do! WOW Marsha!! How fun!! I didn't realize yall were there already!! How cool to be able to just go and homeschool your kids there!! I heart homeschooling!! Can I get a Whoop Whoop!!! I would trade all of our white snow for your white sand in an instant! :P Hope you guys have an amazing and memorable vacation! I'd be tempted to skip the bookwork altogether for the next few months. Your boys got a great day of learning! I don't know why it seems like you're so far away, when you're really no farther from me than when you were in Texas. Weird. I woke up thinking about you being in Guam though and feeling like you were so far. I love the pictures! I can't help but notice the void. 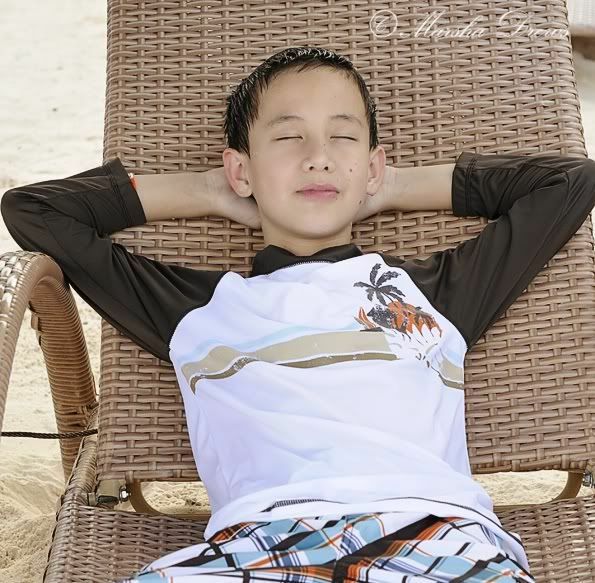 It's hard not to think of how much fun Christian would be having in Guam. No more fun than Heaven, but still...my mommy heart is aching for you this morning, and I'm praying that God would continue to comfort you and strengthen you and comfort and strengthen others through you. Love you, friend! It's difficult not to be envious sitting here in Virginia with temps that are struggling to get above freezing. Love seeing all your pictures. Enjoy!! AMAZING!!!!!!!! I am jealous yet thrilled for you. 'Thrilled' is beating 'jealous' out. What an amazing gift you guys have been given. Hope David feels up to vacay soon. oh girl, what an awesome vacation! it's really cold here. i'm miserable everytime i go outside. Awesome! I hope you have so much fun! Can you go with David when he has those layovers? It would be a fun way to do some traveling! So cool! What an adventure! Hope you are able meet up with Wendi. Bonus points if you can name that song AND the group!!! Okay.....that was a weird tangent! I agree with Angel, I'd pack away the books for three months and learn more about the culture and country you're in right now and make school out of that. SPAM??? My mom and I used to eat fried Spam, cantaloupe and canned spinach on the coffee table while watching The Golden Girls in the evenings. I know, crass show....But SPAM at McD's?? It's one for the history books! NOW start having great adventures!!!!!!!! Gorgeous! I'm living vicariously since I am currently surrounded by snow...in Georgia for crying out loud! 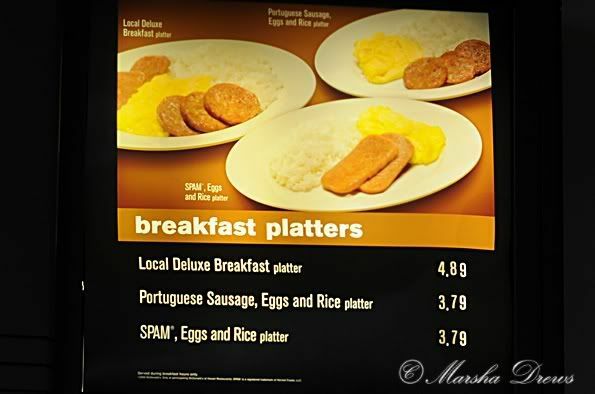 And, girl, I love me some fried Spam for breakfast. Yum! Try eating Spam in rice balls! It is one of my favorite onigiri fillings. Something about the saltiness is just delicious with plain rice. 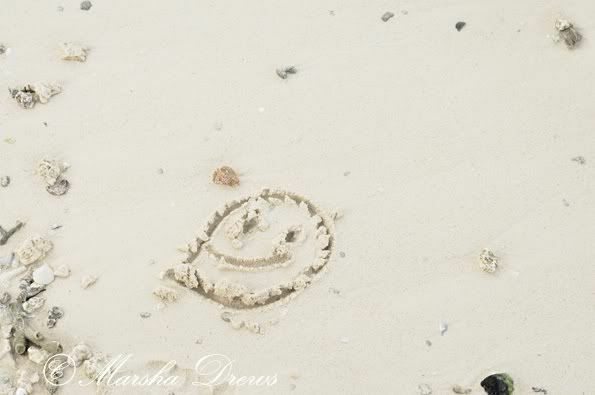 It looks wonderfully fun Marsha. LOVE love LOVE the picture of beautiful you. So creative. You are a wonderful photographer. Wow. Actually, I really like spam, pan fried of course!! The beach looks great! 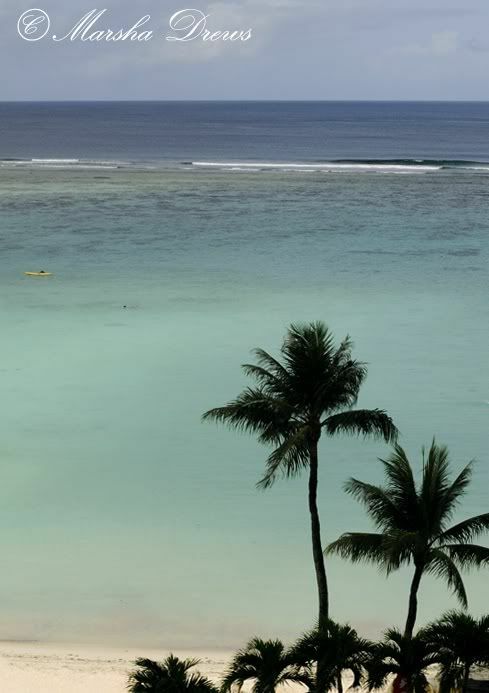 White sand, palm trees..looks like home! I would have a hard time keeping those books out too, we'd enjoy the new surroundings and catch up later!! Looks like sooooooooooo much fun! So jealous! I wish we could all be there soaking up and basking in the sun. *sigh*. Em and I are having a lot of fun with Bobo though. Beautiful ocean pictures. I'm so happy you and your family have some time to relax. Ah, there are some pictures! Yeah! I agree with the school thing...do math and then just learn about the culture you are in and have fun. Oh how that sand and beach and sun look so good right now. Leanne, "don't stop believing" (I'm not great at song titles) by Journey. I think. Absolutely beautiful Marsha! Praying your husband gets over being sick. Keep enjoying yourself and keep taking those pictures! Love them! Glad you made it to Guam safely. Sounds heavenly! I would much rather be on the beach than looking at all this snow we still have on the ground!! It is only 37* right now btw!! As to what we have been doing, my birthday was the 11th, our dog Bella had to be put down yesterday (very sad day) and I am writing again. Just not on my blog yet. I am re-inventing my blog. Have fun for me!! SPAM at McDonald, I never heard of such a thing, lol. Guam?!?!? WOW!!! Y'all have yourselves a grand time there. I hope hubby gets to feeling better very quickly. I will be praying for him. As for Spam....YUM!!! I like to skillet fry it in brown sugar and butter. Tastes so good.